Over the last decade Nicolas Bernier has consistently exhibited his sound-artist credentials in a number of different fields. Regardless of the medium of experimentation – installations, concrete music elaborations, live electronics, post-rock, noise or free improvisation, video-art, dance or theatre – Bernier always executes the performance aspects of his works carefully. The Canadian composer often finds inspiration in old equipment (antique instruments, typewriters), which is reworked into complicated setups and recontextualised. This latest release for LINE was mastered by Taylor Deupree at 12K and the final result is excellent. The sounds are sharp and are divided into highly refined and delicate sequences that have been arranged meticulously, with dilated assonances forming a pleasant continuum. The system here consisted of a series of purpose-built mechanical devices controlled by computers, working in tandem with a group of solenoids activating a row of turning forks. 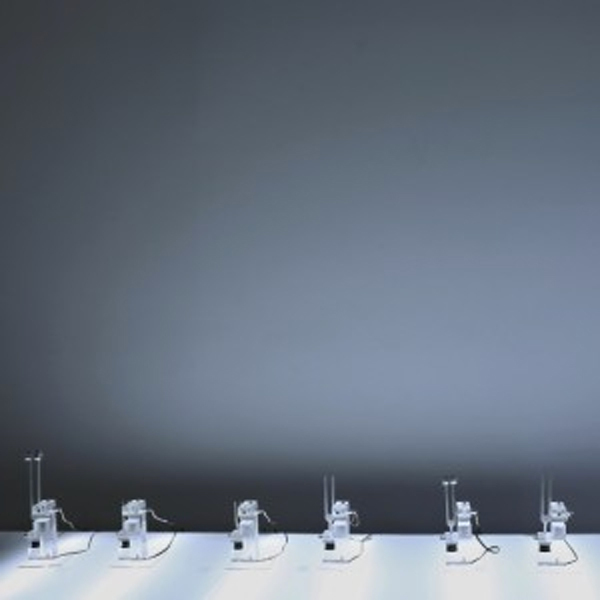 The resulting sound fragments were combined with synthetic sine waves and everything has been done to balance the acoustic and electronic elements in the work – expressing the proper tension between the constituents of the whole. The author’s vision extends to 19th century science but also includes the tradition of tonal instrumental works, a staple of electronic music in all its permutations. It was by no accident that this work was awarded a Golden Nica in the Digital Music and Sound Art section of the 2013 edition of Ars Electronica.